FARCICAL VOYAGE Create a musical parody of ‘The Force Awakens,’ Brittany Law did. Actor and writer Brittany Law—a "life-long Star Wars fan"—was thinking about Episode VII: The Force Awakens when a bizarre idea occurred to her at roughly the speed of light. "I was watching the movie," Law recalls, "and I suddenly realized, 'This would make a great musical!'" She was as serious as a Mynock chewing on a power cable. "It just seemed interesting to think of what songs the different characters would sing at key moments," Law says. "I loved the idea of Kylo Ren singing a ballad about being pulled back and forth between the light and dark side of the Force, or Rey singing about missing her parents. It's perfect material for a musical." 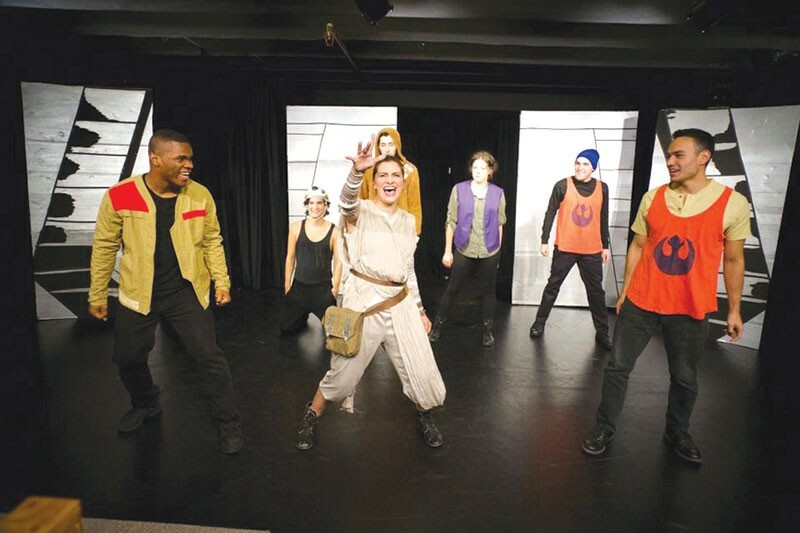 It took Law a year and a half, but now, thanks to a perfect-fit collaboration with Healdsburg's Redwood Theatre Company—and a successful IndieGogo campaign—The Farce Awakens: A Musical 'Star Wars' Parody has opened with a series of free performances in Healdsburg. "It's got the same plot and same characters as The Force Awakens,'" explains Law, "except that it's a comedy instead of a drama—with songs." The cast of 11 includes Law as the heroine, Rey, Kot Takahashi as Poe Dameron, Ezra Hernandez as Kylo Ren, and Isaiah Carter as Finn. The theater company, which lighting designer Trevor Sakai describes as "very DIY," has devised clever and gleefully silly effects to take the place of the movie's eye-popping visuals. "The Storm Troopers use super soakers for blasters," Sakai says. "But we did get our hands on some truly impressive light sabers," he adds. According to Law, one need not have seen the original film to appreciate the humor of the play. "You can be only vaguely familiar and still enjoy yourself," she says. "Even if you've never seen any of the Star Wars films, you can appreciate it as an entertaining take on science-fiction genres. "It's pretty funny too," she adds, "and every joke comes from a place of love. The Farce Awakens is our way of celebrating our love of Star Wars." 'The Farce Awakens' runs Friday–Sunday (with one Thursday, Aug. 10) through Aug. 13, at Redwood Theatre Company, 440 Moore Lane, Healdsburg. Thursday–Saturday, 7:30pm; Sunday, 2pm. All seats are free, but reservations strongly recommended. redwoodtheatrecompany.com.